The Australian Government is introducing new food labelling law requirements in order to make it clearer where the products consumers buy are produced, grown, made or packed. New labelling laws are coming into effect as of the 1st of July 2018. The new, easy to understand labels will tell you at first glance where a product comes from, so consumers can make a clear and informed decision. Read more to find out more information on what the new labels look like, why labels are changing and what different labels mean. The Australian government is making a number of changes to product labelling laws, that will help to make it clearer where the food you buy was grown, made and packed, along with the origin of other products. The law requires manufacturers and growers to provide easy to understand labels, which will make it possible to tell at a glance where each product came from. This should help people to make an informed decision about what they buy. There are new standards for what labels should look like. The Australian government wants to make sure that labels all look similar, so that you don't have to study the product labels and read every item on the back of the packet, to figure out where something came from. With the new product labelling laws it is easy to tell not just where foreign foods were imported from, but also what percentage of the ingredients in a food were sourced from Australia too. The Australian government is responding to demands that Australian shoppers have been making for many years. Consumers have wanted to see changes to the origin claims that are made on food labels. They wanted the labels to be clearer and more meaningful and to have confidence that they were actually getting accurate information. The country of origin labelling that existed in Australia has, up to now, been rather unclear. It is not easy to understand the distinction between a "made in" claim and a "product of" claim. The new laws dictate exactly what manufacturers, packers and growers should say on their labels. The changes have already begun. The requirements for 'country of origin' labels have been in effect since 2016, and stores that sell food already use those labels. The government allowed for a two year transition period, however, so that companies could still sell their existing stock, and so that packaged food companies had time to make changes to their labels. The transition period will end on the 1st July 2018, and all new food that is labelled after that date must follow the new labelling rules. Existing food that has not yet expired can stay on store shelves, so it may take a little while after the end of the transition period for every product in stores to feature the new labels. What Do The Labels Say? The new labels for food that is Australian in origin are "Grown in Australia" if all of the food was indeed grown in Australia, and "Product of Australia" if the ingredients were grown in Australian and all processing was done there. There is also "Made in Australia" for food products where most ingredients are Australian, but some may be foreign, and major processing was done in Australia. Those products will feature a kangaroo symbol, and text explaining the percentage of the ingredients that came from the country. There will also be a bar chart providing a visual representation of the percentage. 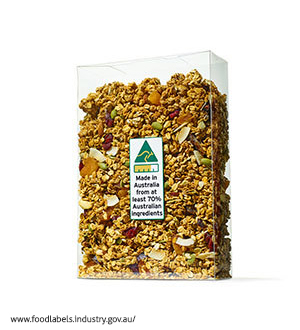 Products that were "Packed in Australia" will show the bar chart to indicate the percentage of Australian ingredients, as well as the text explanation. Imported foods must have a clear "Product of France" or "Product of Spain", etc on them to indicate their country of origin. This must be displayed prominently. The food labelling regulations should help shoppers to make better decisions. Many consumers are concerned about food miles. They do not want to buy products that have been imported; especially if the same products can be grown and made in Australia. They would prefer to live ethically, eating in-season food that is produced in Australia because it reduces their carbon footprint, means that they get fresh food, and also helps to support the Australian economy. It will not always be possible to do this, but buying from countries that are known for good produce, and buying local when you can, is a good way to save money, eat a varied diet, and ensure that you enjoy a healthy lifestyle while reducing your carbon footprint. If you are a food manufacturer, and you want to sell products in Australia, then you will need to comply with the new product labelling laws. If you aren't prepared for the changes in the law, then you should work with a company that has the required expertise. As experts in the package labelling industry, we understand what it takes to make your product stand out on supermarket shelves and follow labelling laws in the country. 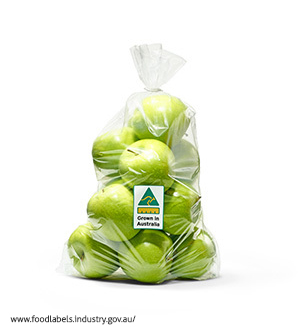 Call the Onpack team today to discuss your needs and learn more about producing food labels for the Australian market.